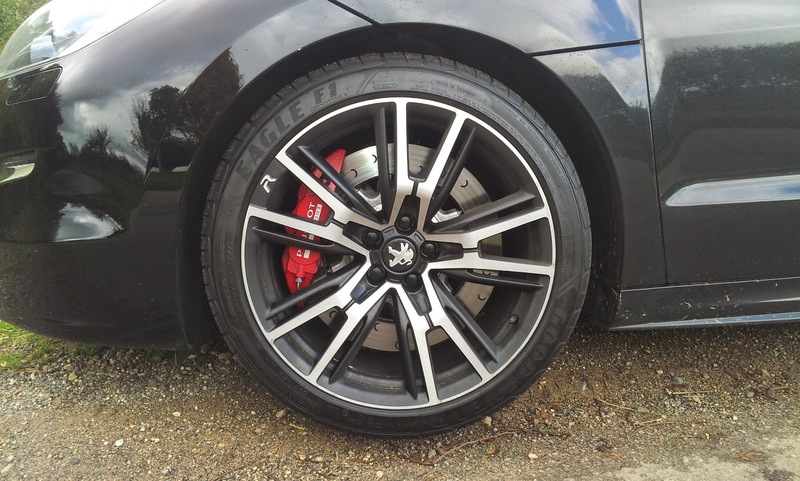 Speedmonkey: Peugeot RCZ R - First Drive Review - Road Trip! Peugeot RCZ R - First Drive Review - Road Trip! 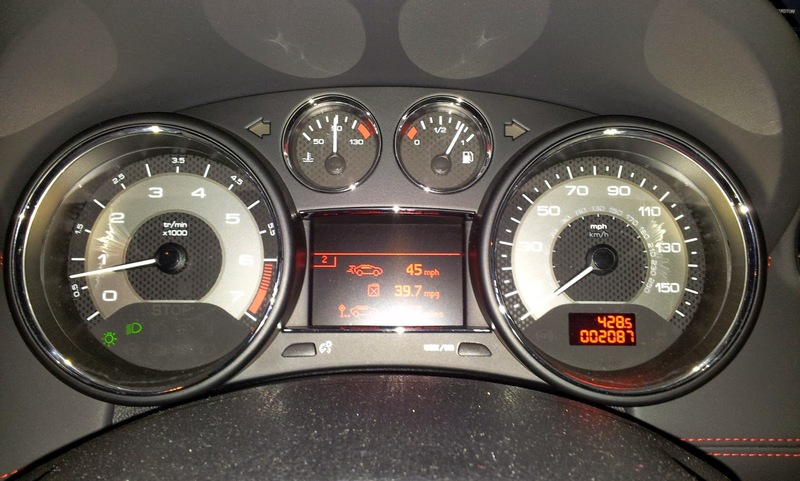 Colin Hubbard has a Peugeot RCZ R for a week. Here's his first drive review combined with a long day's road trip. I had some work commitments in far away places that I'd been putting off for too long, and also a new car to purchase for my wife. With a Peugeot RCZ R due to be delivered I decided to combine all of these things into one long day. A road trip was born. I left the house at 06:00 and made my way in the dark and wet to the RCZ R that had been delivered the day before. I hadn't yet seen it in daylight and despite having a RCZ a few months back it takes time to familiarise yourself with the controls, functions and positioning. I sat myself in the heavily bolstered driver's seat and dropped my bag on the passenger seat. My thermos coffee cup sat nicely in the single cupholder between the seats and I located my TomTom on the right of the windscreen. The RCZ has a built in satnav but it won't take UK postcodes and I hate getting lost. I programmed the TomTom to take me to my first appointment which was a paper storage depot in Northampton, some 120 miles away. The engine starts with a key which is fine by me and turns over with a slightly gruffer engine tone than the normal models. It's deadly quiet compared to my TT V6, which was no doubt appreciated by my family and neighbours on this early morning. I depressed the clutch and noticed how light it is, considering it's a heavy duty item to cope with 270bhp from the little 1.6 turbo 4 pot. Select 1st from a rather smooth alloy gear knob and head out from my drive onto the local A-roads, noticing the ride is surprisingly choppy which makes me think this is going to be a very long day. After 10 minutes I was on the M6 heading south and the ride calmed as the road quality improved and direction straightens. I got up to motorway speeds and settled to a steady cruising speed, dodging lorries and lane 2 hogging cars. The hard ride comes into its own on the motorway as it feels like a go-kart in that you move the wheel and there's no slop in the bushes or damping so the car moves in correlation with the wheel to the nth degree. A soft push is felt on the opposite Alcantara shoulder bolster to direction change as you move lane. 6th gear is well suited to motorway speeds so at 70mph the engine is spinning at 2,800rpm, which is calm, yet there's also good pull from this rev level. I couldn't recall how to set the cruise control so that will have to wait for daylight. Sometime later I switched from the M6 onto the M1 for a short hop to Northampton. As I had plenty of time I stopped off at Rothersthorpe Services for my road trip treat of a McDonalds breakfast. As I turned on full lock into a parking space the limited slip differential groaned as it tried to push both front wheels at equal-ish speeds. After a soggy sausage bagel, lovely hash brown and well needed coffee I headed back to the car. 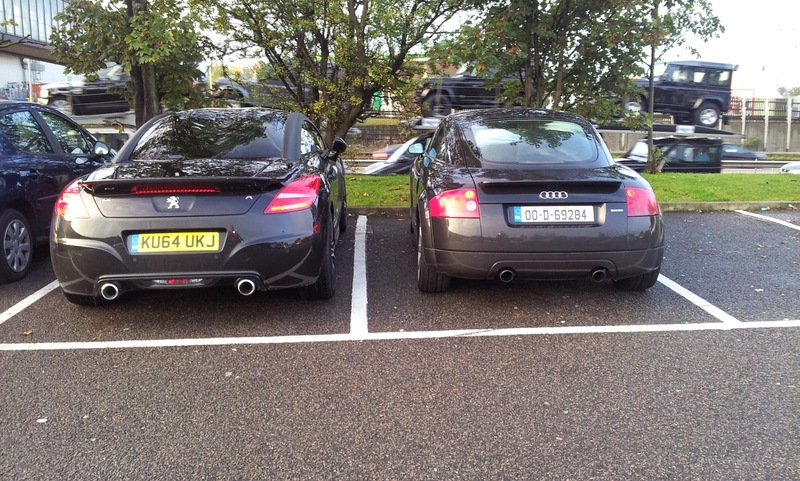 I found a Mk1 Audi TT had parked next to me and it's obvious to me the TT's looks were a heavy influence in the RCZ's design inspiration, although the RCZ is so much bigger than the TT. Both great looking cars! 15 minutes later and I parked up at Howard Smith Paper for a meeting over the decommissioning of my client's mobile phone installation on the roof of its building. After 2 hours spent looking at the installation from the inside of the building I head back to the car park and soak in the details of the RCZ in proper daylight. It is a fabulous looking car, the R gets unique alloys (which help to cool the uprated brakes), a fixed rear spoiler and matt black roof arches which differentiate it from the already good looking RCZ. 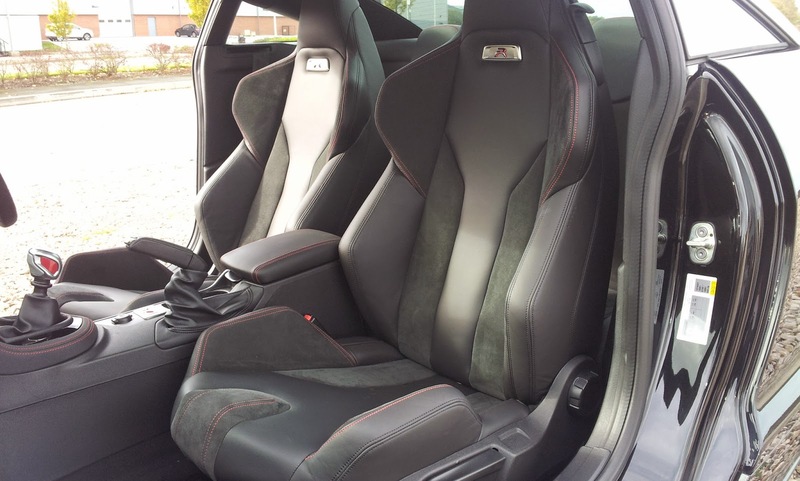 On the inside the seats are a work of art and wouldn't look out of place in a Lamborghini. The gear knob is carried over from the 208 GTI, has 3 different colours and is a joy to stir the gears with as it is smooth and nicely shaped. Next, I'm off to Coventry to look at an 'immaculate' Audi A6 Avant in Ibis White to replace our now sold BMW 320d. The sat nav took me on the A45 towards Coventry which is littered with 50mph limits and speed cameras so I took the time to figure out the cruise control. It is operated from a lower left stalk and, once armed, speed is adjusted via two buttons on the same stalk. The speed is shown in a digital display between the clocks and you can alter the it by 1mph at a time. I set it to 53mph which, according to the satellite calculated speed from my TomTom, is exactly 50mph. When in Coventry the hard damping revels in the turns and twist of the side roads and I found it perfectly acceptable for my own taste. The A6 is parked on a rough street and as I walked up to it I saw the first mark on the rear wheel arch. As I walked around I saw more marks and think about walking away - but decide to wait for the trader to turn up. 10 minutes later he arrives, we chat, I ask if he has both keys, the reply is no but the previous owner said he will send them on if he finds them. Yeah yeah. I also ask where the immaculate Audi is as this clearly isn't immaculate and, as I point out the half dozen marks on the body, the trader remarks, "ooh I didn't notice that," and, "that wasn't there this morning," and as there's no movement in the price I walk away without even opening a door never mind going for a test drive. Now off to Boston which will be a pain in the arse as the route is diagonal across the country on some tiny roads which will no doubt be littered with HGV's on their journeys to the middle of nowhere. Just before I set off I connected my phone to the Peugeot's Bluetooth system - this is done simply and quickly and is a lesson to other manufacturers. I set off and call the wife to update her on the car situation, the call is clear and easily made but you do have to stretch out to press the buttons on the infotainment system which is annoying. The problem is the upper centre console rakes back towards the windscreen so while the heater controls can be reached easily you have to stretch to be able to touch the hi-fi and phone controls. As I passed Leicester if find my assumption on the nightmare journey is totally wrong, it turns out that the A52 is actually a brilliant road and fabulous fun in the zingy, curvy Peugeot. The mix of high power and high torque (243lb/ft) with a lightweight 4 pot motor and mechanical LSD means progress is fast and steady. The scatterings of tractors and doddering Landrovers were simply annihilated with a good dose of right foot and it stepped back in quickly and safely afterwards. The wheel control in the R is much, much better than the other models, no doubt helped by the lighter alloys but also the stiffened suspension and bracing. The handling has been tuned by Peugeot Sport and they have done a damn fine job. The RCZ R is 10mm lower than the rest of the range and whilst hard it is very accurate and stable so the car can be placed inch perfect without being thrown off line by potholes. Compared with a well damped German car the French car's damping is almost elastic in feel rather than fluid, I suspect down to the hard bushing and tight damping. I would go so far as to say that it's on par with the front wheel drive hot hatch king, the Megane 265 Cup and only a back to back test would reveal which is the better car. When I get to my destination in Boston to view a 520d Touring the private drive to the trader's house is littered with deep potholes which are a potential challenge to the hard ride and low body height. I needn't have worried as there was no awkward scratching noises nor crashing through the wheel when the Goodyear Eagle F1s suddenly hit the other side of a pothole. When I see the Le Mans blue Beemer it looks great but needed to be jump started by the trader as a seized rear wiper meant that the rear screen wouldn't close so the interior light stayed on, which then drained the battery. A brief drive reveals it as a large, heavy car which is kind of what I expected but also a little prehistoric in terms of feel - yet it was only 5 years old. It was a genuine enough car with a full BMW service history and 2 keys but the missing sat nav disc, missing floor mats, seized wiper and the traders refusal to budge on the price meant I didn't leave a deposit. My intention was to think about it overnight but the final straw of no heated seats meant I'm still looking for a new car. My last stop en route was in Messingham, just outside Scunthorpe, which was some 60 miles away and the same mix of roads as the journey to Boston. The roads turn slightly different as I headed north - straighter and more open with long reaching views which offer great overtaking potential and the R didn't fail to impress again, surprising a BMW driver, which is always nice. There's no escaping torque steer in a 270bhp front wheel drive car, the forward pulling motion is exaggerated with higher power but the mechanical limited slip diff does a great job of balancing traction to either front wheel. Physics are still there and it does pull increasingly at higher revs where most of the power is. You have to hold the wheel tight during full bore acceleration but luckily the steering is light and direct so any compensation required is easily dealt with. The speed limits though the Lincoln area really had me confused and annoyed. I entered a large village which was a 40mph limit and as I drove through (at about 35mph (remember it's a limit not a target)) there were families walking and cyclists cycling and then I got to the other side and it was still 40mph. The village should have been a 30mph. At the other end of the scale were some very quiet open roads about a mile before a small village which were marked as 30mph and all that was about were farms. Absolutely crazy regulation of limits which needs an outsider to regularise. After leaving Lincoln on the A15 it remained eerily straight for 16 miles like something you would expect in America. I started getting tired and with traffic at a steady speed there was no point overtaking to gain a few seconds here and there which just annoys other drivers. I tried to wake myself a little by turning up the volume on the excellent standard fit JBL sound system. Up to this point I had been listening to Radio 2 so I popped a Metallica (Black Album) CD into the single CD slot and the Just Bloody Loud speakers coped well with the highs and lows of Los Angeles's finest. It may not be a high end (read high price) set up like Bose or Harman Kardon with many speakers and an additional amplifier but it produces cracking sound quality and some good volume from just 6 speakers. I turn off the A15 onto the B4100 which provides some opportunities for a little more fun, some nice straights and then fast corners until it becomes built up and 30mph limits. I entered Messingham and located the garage where I am to meet the owner to discuss the positioning of a new cabinet as part of a 4G telecoms upgrade for EE. I agreed the location for the new cabinet and then drove onto the forecourt to fill up with fuel. I put in 10.56 gallons of unleaded and calculated the RCZ R has done a real world 32.9mpg which is pretty impressive considering how hard it has been driven. I left Messingham at 16:40 and according to TomTom it was 120 miles and just over 2 hours to home. On the M62. Oh joy! I was soon on motorways, first the M180, then the M18 and then the M62 which will take me the majority of the way home. Strangely, at rush hour the M62 is free flowing and the R settles on cruise at an appropriate pace. The ride was still noticeably firm but it's forgiven the moment you change lane and feel the stability of the car. Soon I dropped on to the M6 for a short hop then onto the M56 for a junction before getting onto the A559 to near enough home. The A559 is a winding tree lined county road well known for a high death rate as the corners get increasing tighter and catch drivers out but I know this road like the back of my hand so I can play safely. Out of tight corners in second gear the torque steer builds quickly from 4,000rpm and is great fun to interact with through the thin rimmed steering wheel. Many new cars are dull lifeless boxes but this feels alive and edgy. The uprated brakes (380mm floating dics and 4 piston calipers) come into full use along here, they have huge stopping power and practically no fade yet still offer a good degree of modulation through the pedal. Sadly the journey's about to end as I turned into my road - Ollershaw Lane. 1 mile later and I turned into my drive and parked up at 18:57. I'd been on the road for 13 hours and 428 miles and predictably was knackered but I didn't have a single ache or pain from sitting in the same position for many hours. That's pretty impressive and partly due to the good driving position but is mostly down to the seats in the R. They could have been moulded to fit my torso as they are so comfy yet also supportive in the corners, nevermind looking like they have been plucked from something Italian and very expensive. I got out of the car, gave it a pat on the Le Mans scooped roof, closed the door and went in the house for a well deserved brew. What a day, what a car! The Peugeot Sport team have done an excellent job.